Privatisation of M&C to be RNAV-accretive, if the deal goes through. 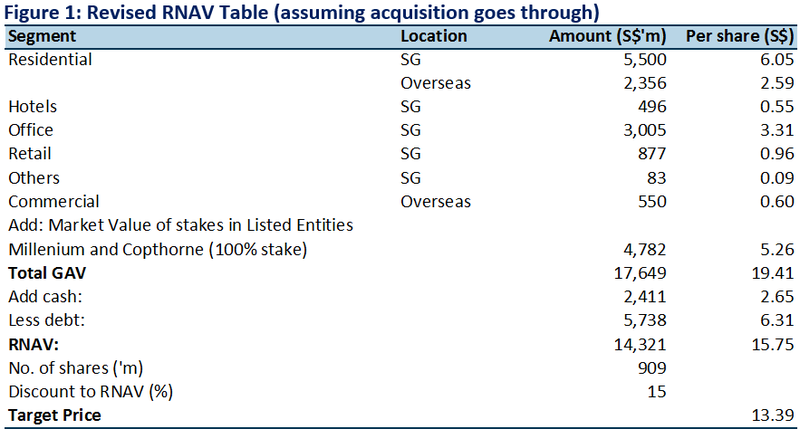 Consolidation of M&C will lift RNAV by c.10.6% to S$15.75/share, with a corresponding adjusted TP of S$13.39 (from S$12.10). Post-acquisition, M&C will make up 27% of CDL’s total GAV. Final offer of 620 pence/share is 12% higher than previously mooted offer price. Despite a 39% premium to pre-offer last close price, it represents an attractive value for CDL as it is pegged at 0.75x P/BV. The hotels are valued at cost in the books. Positive for CDL regardless if privatisation goes through as positive sentiment buoys M&C share price. CDL announced a Final Offer for the remaining shares of M&C it doesn’t own. The new offer at 620 pence/share (inclusive of special dividend) is 12% higher than the previously offered price. M&C’s independent Directors deemed the offer fair and reasonable and unanimously recommend the Final Offer to M&C shareholders. The final offer is conditional on CDL receiving acceptance from more than 50% of the total shares they do not currently own. CDL’s intention is to de-list M&C as soon as the Final Offer is declared wholly unconditional. Aggregate cash payable is c.£682mn, to be funded via internal cash and debt. Minority investors caught between a rock and a hard place. While 12% higher than the previously mooted price, the improved offer still represents a significant 25% discount to M&C’s net book value. This should form the main impediment to minority investors accepting the Final Offer. Nonetheless, due to the intensive capital requirement and low-returns nature of the business, M&C has historically traded at a sizable discount to its book (Figure 4). Even with its hotels carried at cost, the highest valuation M&C traded at in the past decade post GFC was still a 7% discount to book. Without a clear monetization strategy for its assets, investors hoping for an exit opportunity at a significant premium to book value could be in for a prolonged wait. Improved offer at 0.75x P/BV but still at a discount to peer valuation. We note that the offer price is close to average post-GFC P/BV valuation of 0.74 for M&C. However, the offer price also represents a discount to the average valuation of 0.98x P/BV for M&C’s locally listed peers who are hotel operators with similar asset-heavy balance sheets and most self-owned hotels (Figure 2). Positive for CDL regardless if privatisation goes through. CDL currently already owns 65% of M&C. Successful privatisation of M&C would result in a nimbler company with centralised decision-making control and tremendous monetization potential after the 3 year moratorium on the sale or repositioning of Group hotels end. Even without a successful privatisation, we opine that the offer, as well as vocal resistance by minority shareholders including Aberdeen Standard Investments and Fidelity International over the “inadequate offer”, would have provided reasonable support to the trading price of M&C. With this assumption, we think it is unlikely prices will fall back to the pre-offer valuation of 0.55x P/NAV which is lowest in a decade post GFC, even if the Final Offer does not go through. Post full consolidation at book value, M&C makes up 27% of CDL’s total Gross Asset Value (GAV). Assuming the current offer price is successful, post-consolidation of M&C accounts could result in a 10.6% uplift in our RNAV to S$15.75, translating to an increased TP of S$13.39. We assumed utilisation of full cash in the balance sheet for acquisition. Post-acquisition of M&C, we arrive at an upward-adjusted RNAV of S$15.75, with TP correspondingly increased to S$13.39. For now, pending conclusion of the deal, we maintain ACCUMULATE with a TP of S$12.10. We continue to favour CDL for its large Singapore development exposure of unlaunched and available for sale inventory to capture the potential upswing in SG property prices. 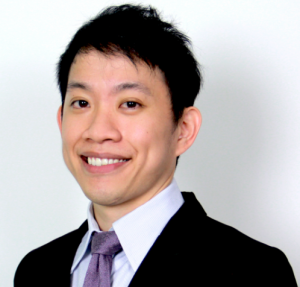 Post consolidation, SG residential makes up c.31% of adjusted GAV. Including properties in other sectors, SG exposure stands at c.56% of adjusted GAV.